Polyethylene terephthalate or PET bottles are one of the most valuable forms of plastic in the Philippines and the most retrieved due to its high residual value – or its predicted value after consumption. PET bottles are commonly used in food and beverage packaging. A study conducted by global advocacy firm McKinsey Center for Business and Environment showed that the Philippines has one of the highest PET bottle recovery rates at 90 percent. “Higher residual value plastics are more likely to be collected from disposal sites and then resold. 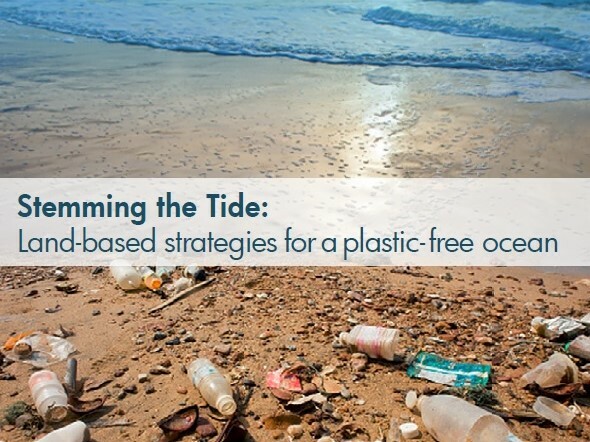 This means that products or packaging with low residual value are less likely to be collected; they therefore become a particularly significant contributor to ocean plastic,” the study, entitled “Stemming the Tide: Land-based Strategies for a Plastic-free Ocean” said. Of the total post-consumption plastic waste produced in the country, 80 percent are low residual value plastics composed of sachets and single-use plastic bags owing to the local retail industry’s sachet-economy wherein products are packaged into single-use portions. If PET bottles have a high extraction rate, it is quite the opposite for low residual value plastics. Often neglected by waste pickers, plastics belonging to the category have close to zero percentage collection rate. “Waste pickers simply cannot generate enough wages from low-value plastics to warrant the time spent collecting them. We calculated the earnings for waste pickers using two metrics: the material value of the plastic waste in terms of the price paid for it by primary buyers (“junk shops”), and the average amount of time taken to extract the item from the waste stream. Over a ten-hour collection day focused exclusively on plastic bags, a waste picker might earn as little as P25 ($.50). Were the waste picker to focus on PET bottles, however, he or she might earn more than seven times that amount,” the study said. Metro Manila has one of the highest plastic waste densities in the world – annually, the 620-square kilometer capital produces over 560,000 metric tons of plastic waste, which translates to about 900 metric tons per square kilometer. In comparison, the financial capital of China, Shanghai, has an annual plastic waste density of 200 metric tons per square kilometer. While the country has an 85 to 90 percent waste collection average rate in urban areas, it plummets to less than 80 percent in rural areas. The Autonomous Region in Muslim Mindanao has a collection rate of only 40 percent. Another contributor to the growing post-consumption plastic waste problem is the lack of a proper waste management infrastructure. The study highlighted key areas where plastics are leaked into the oceans and these includes rural areas that do not have a proper waste collection method due to its low waste density, and high density urban areas that are not able to cope with the influx of development. Illegal dumping by trash haulers and oversaturated dumpsites are also some areas that leak plastic waste into the oceans. The growing post-consumption plastic waste problem is a real concern that needs to be resolved with the cooperation of all stakeholders in various industries and a revisit of the consumption methods of the general public.